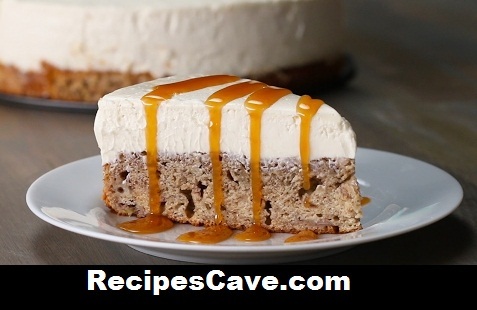 Banana Bread Cheesecake Recipe - Hi, this is Banana a and bread bottom side cheesecake recipe for fruit and cheese loving people, hope you will enjoy this easy recipe. Here is what you'll need to cook Banana Bread Cheesecake Recipe for serving 10 peoples. Add in the oil, egg, vanilla, and sugar. Stir until combined. Add in the flour, baking powder, baking soda, salt, and cinnamon. Stir until just combined. Don’t over mix. Pour the banana bread batter into a greased springform pan and bake for 30-40 minutes or until the top is set. In a large bowl, add the softened cream cheese, sugar, and vanilla. Whisk until combined. Microwave the milk until hot for about 2 minutes, and add in the gelatin powder. Pour the cheesecake mixture over the baked banana bread and cool for 3 hours or overnight. Drizzle with caramel and enjoy. Your Banana Bread Cheesecake Recipe is ready to taste.